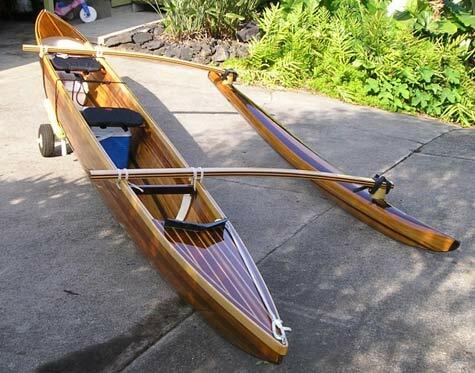 The Ulua design broadly resembles the classic Hawaiian canoe with some differences. The round bottom, which is important in the surf, performs poorly when sailed to windward. I've added a pivoting leeboard for lateral resistance, that can be retracted when paddling or landing in surf. A steering oar or rudder can be used instead of the traditional paddle for steering. The Ulua hull has a little more vee in the hull than a traditional Hawaiian model, and this improves it’s speed and windward sailing ability. Watertight bulkheads in each end of the hull provide reserve buoyancy in the event of damage or capsize. Additional reserve buoyancy can be built in under the two seats in the form of foam blocks or hollow storage compartments. The hull is constructed with the strip composite method. The ama can be either solid foam covered with fiberglass, or hollow and strip planked, with foam or plastic bottles inside for emergency floatation. The large ama is of sufficient size to support cargo stored on the iakos along with a crew member on the hiking seat. The sailing rig shown is of a modern Hawaiian type. The availability of fiberglass windsurfer masts allows for a very simple lightweight plug-in rig which can be lowered entirely while at sea and stowed on the iakos. A brailing line folds the boom and sail up against the mast for quick furling, and avoids dumping the sail onto the crew. 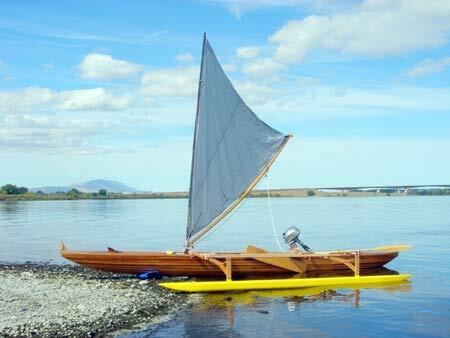 The Ulua can be paddled, sailed, surfed or powered by a two horsepower outboard motor. 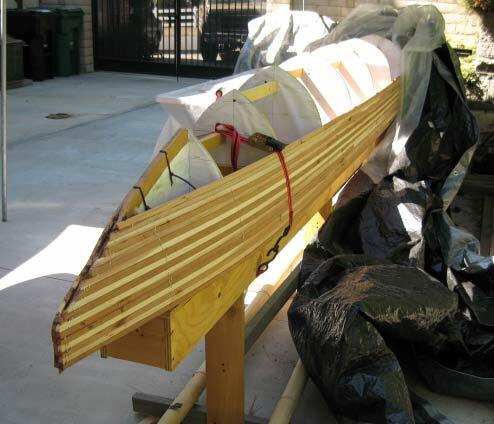 This canoe is capable of extended coastal expeditions, and can be car-topped to your favorite launching spot, or carried on its side on a trailer with the ama up in the air. 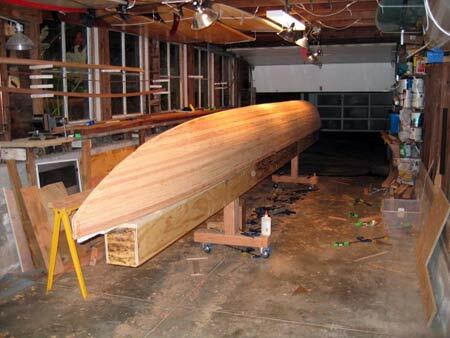 The hull can be stretched to a greater length by increasing the spacing between the molds before the planking begins. You can safely increase the hull length by 150% without any changes to the structure. 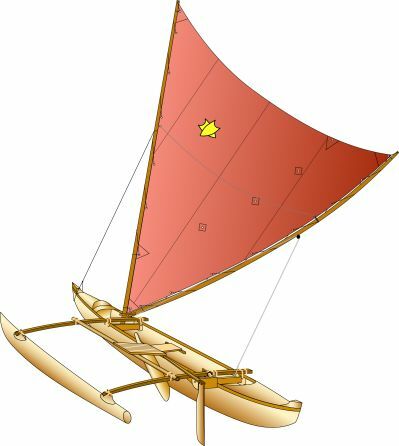 These plans for the 18' (5.5M) Ulua outrigger sailing canoe for the homebuilder are for strip composite construction. Eight pattern sheets include full scale patterns for the station molds and stems. Three additional sheets show the sailplan and construction details. An included CD contains additional drawings, full instructions, and a basic course in boatbuilding skills. Ulua can be stretched out to 27 ft (8.1 meter) through wider spacing of the mold stations Other hull dimensions remain the same. Bill Dochnahl's Ulua stretched to 27 ft.
Michael Litter's Ulua stretched to 24 ft.